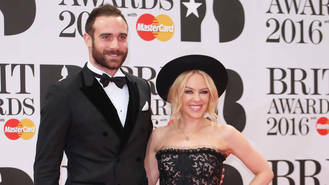 The singer and Joshua announced their engagement in February (16) after a whirlwind romance, and a recent report in Australia's Woman's World tabloid led fans to believe the pair had already exchanged vows by staging a surprise wedding while celebrating Kylie's 48th birthday on 28 May (16). Sources claimed the Spinning Around hitmaker flew family members to the island of Sifnos to take part in their big day, but Joshua has laughed off the report. "Apparently I was at a big fat Greek wedding... wish I'd been there! @kylieminogue," the 28-year-old quipped in a post on Twitter.com, adding the hashtag, "#rumoursrumoursrumours". Kylie confirmed there had been no wedding by reposting her fiance's message on her own official page. The stars have been dating since meeting and falling in love on the set of Joshua's medieval comedy Galavant last September (15). They officially announced their engagement in the marriage section of Britain's Daily Telegraph newspaper. "The engagement is announced between Joshua, son of the late Dominic Sasse and of Mary Heale (nee Macauley), of Herefordshire and Kylie, eldest daughter of Ronald and Carol Minogue, of Melbourne, Australia," read the notice. Reports suggest Sasse proposed during a skiing vacation in Switzerland over the Christmas holidays and Kylie has been wearing his ring since the beginning of the year (16). Kylie was previously engaged to Spanish model Andres Velencoso, but the couple split in 2013. She also dated Halle Berry's ex-husband Olivier Martinez and tragic INXS star Michael Hutchence.